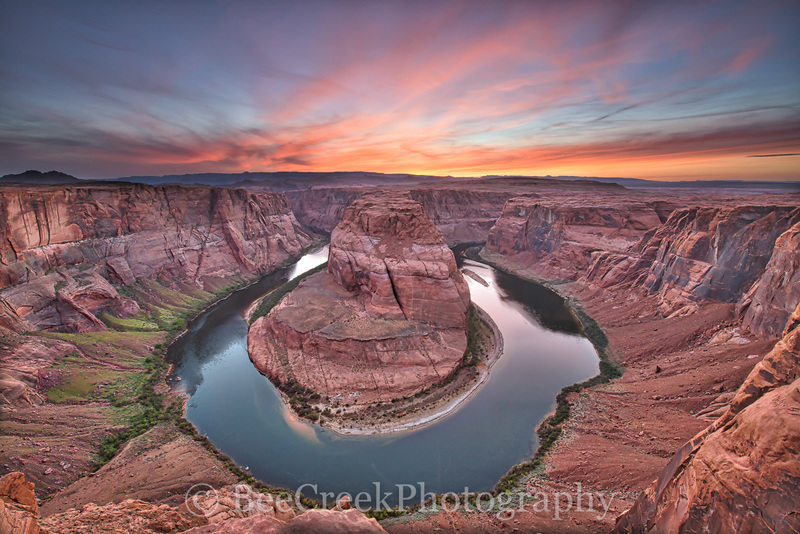 Sunset over Horse Shoe Bend - The Horshoe bend is a horseshoe-shaped meander of the Colorado River located near the town of Page, Arizona, in the United States. Horseshoe Bend is located 5 miles downstream from the Glen Canyon Dam and Lake Powell within Glen Canyon National Recreation Area, about 4 miles southwest of Page. It is accessible via hiking a 1.5-mile round trip from U.S. Route 89, but an access road also reaches the geological structure, as it is part of a state park. The Horseshoe Bend can be viewed from the steep cliff above. The overlook is 4,200 feet above sea level and the Colorado River is at 3,200 feet above sea level, making it a 1,000-foot drop so watch your step. The climb up does not taking any climbing but it is not a walk in the park. I finally got to a spot for this photo and waited for the sun to set but it didn;t really do what I was hoping for so a lot of people left but I decided to stick around a little longer and I am glad I did because as the sun went down it lite up the sky with a array of colors from reds, pinks to oranges against a backdrop of blue for a spectacular sunset. Photo © copyright by Bee Creek Photography - Tod Grubbs / Cynthia Hestand.